Kientruc O completes kindergarten made from a cluster of gabled blocks - Dr Wong - Emporium of Tings. Web Magazine. 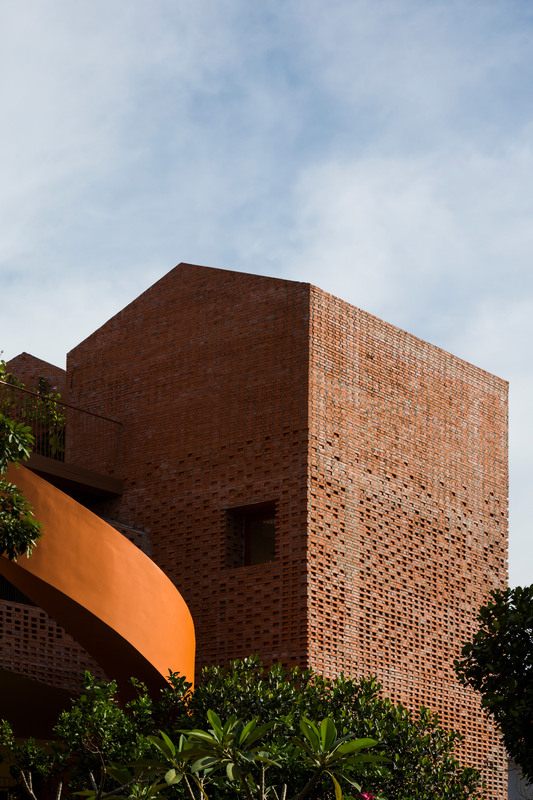 Architecture studio Kientruc O has designed a kindergarten in Ho Chi Minh City, which is made up of a stack of gabled brick blocks and features a curving cantilevered staircase leading to a roof garden. 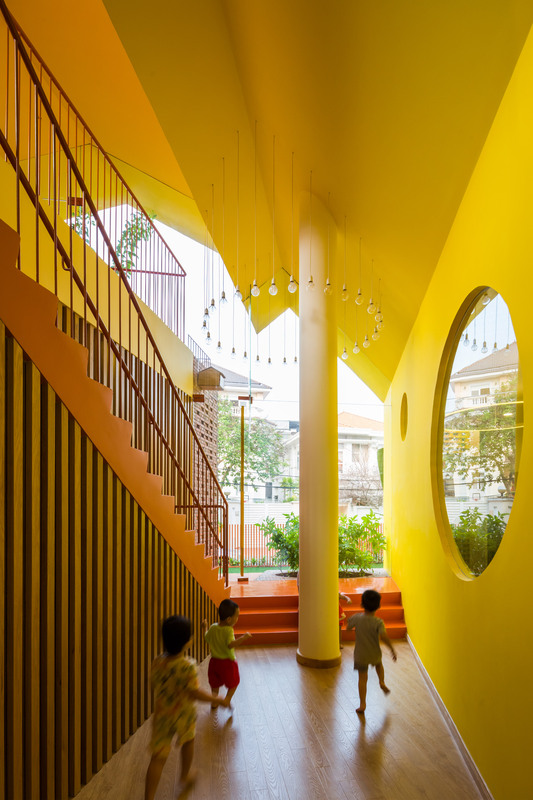 In 2015, the firm headed up by architect Đàm Vũ converted an old townhouse in the Vietnamese capital’s District 1 into the first Chuon Chuon Kim Kindergarten, which featured a cluster of small gabled spaces intended to relate to the size of the building’s users. 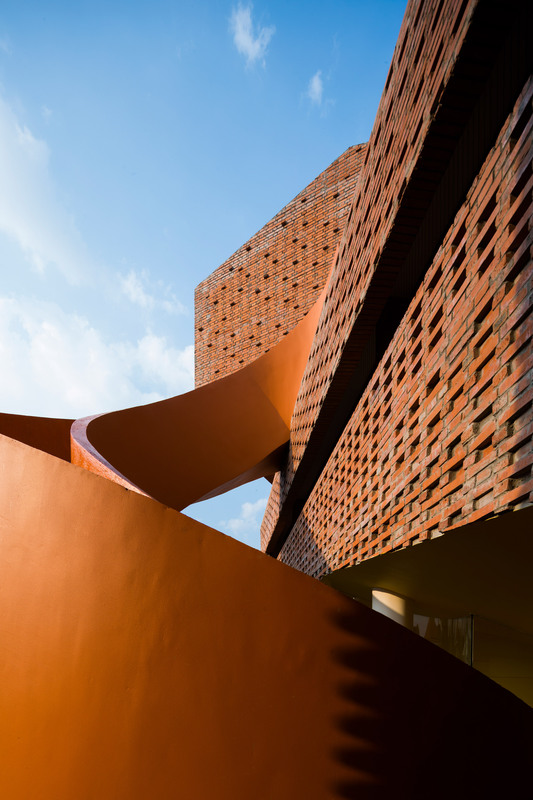 The new kindergarten in District 2 repeats this concept by combining a series of brick-clad gabled forms that diminish its overall visual mass and break it down into legible sections. The consistent use of exposed brick creates a sense of uniformity, while the offset configuration of the various volumes led the architects to compare the completed structure to the famous Danish building toy Lego. Kientruc O believes in creating educational buildings that provide stimulating environments for both pupils and staff, with architecture that promotes exploration and offer various opportunities for interaction. The kindergarten’s classrooms and utility spaces are arranged in an ascending spiral around a central core containing the main circulation. 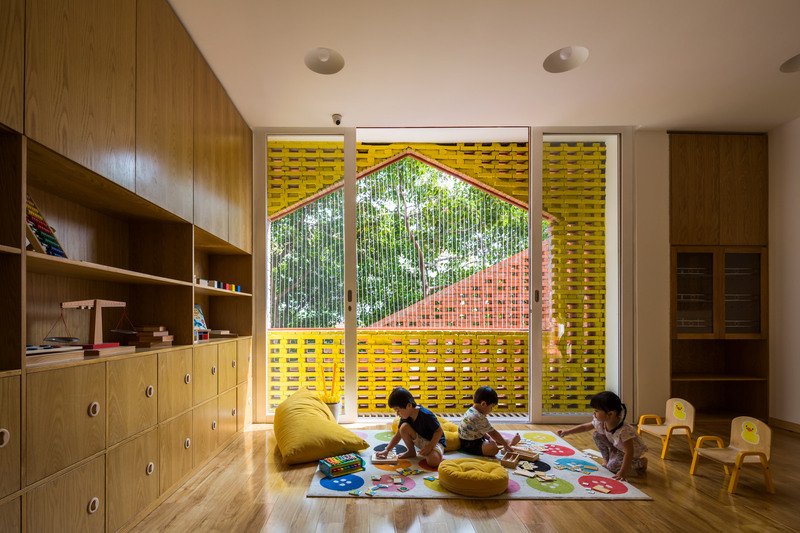 “Each floor is arranged in an alternating pattern to enhance vertical interaction, encourage children to be more receptive of their surroundings, and stimulate their inner creativity,” said the architects. The central circulation is designed as a vibrant counterpoint to the more sober classroom environments, with colourful surfaces and gardens on several levels. An entrance gate slotted into a house-shaped brick structure provides access to a garden on the ground floor, which connects with a corridor traversing the building. 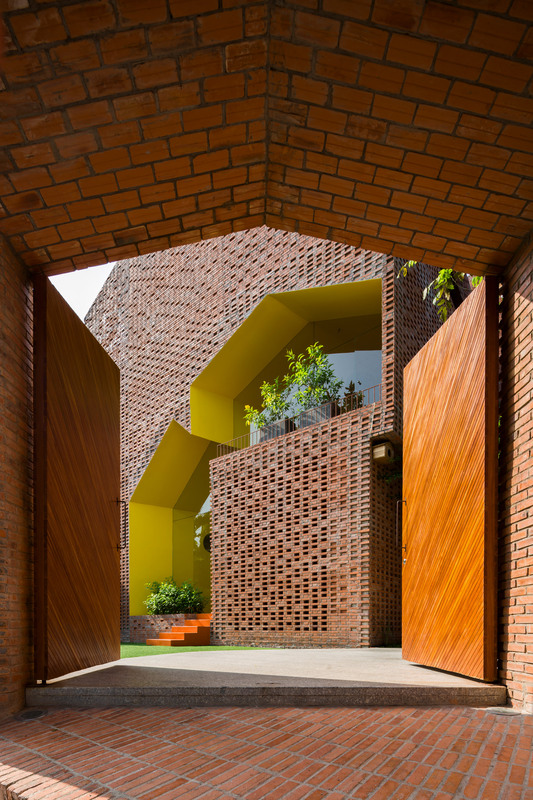 The outline of the hallway resembles a pair of intersecting gabled forms that puncture the facade of one of the brick structures and create a void framing views out towards the garden. 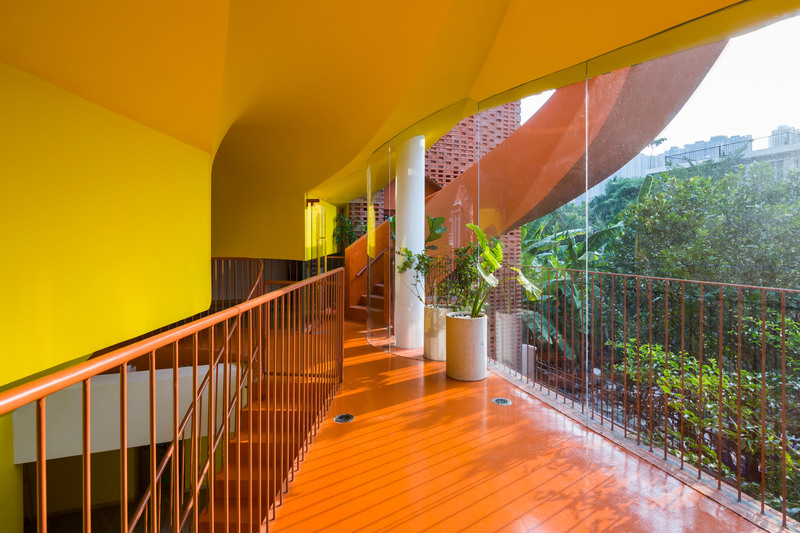 An orange staircase ascends to an open-air landing on the first floor, from which the curving concrete stair sweeps up onto a rooftop that faces the Saigon river. A spiralling staircase contained in a brick-lined void provides an alternative and more intimate route through the building. 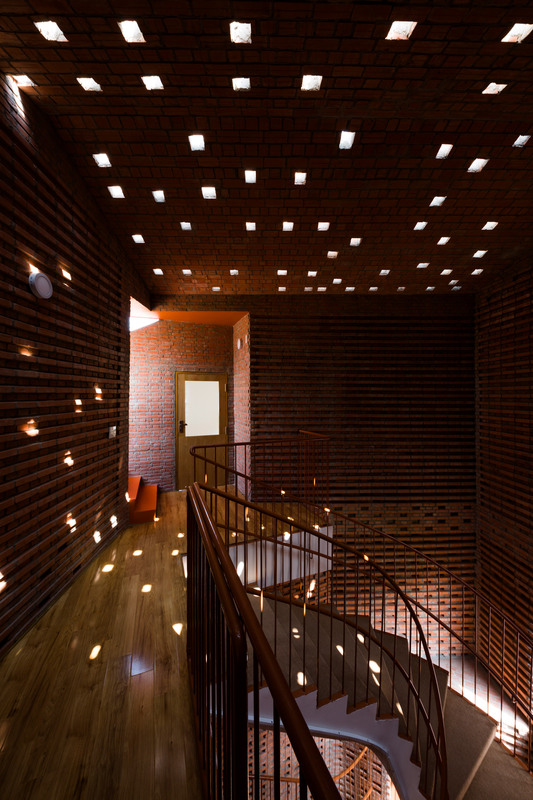 Perforations in the brick walls and ceiling allow light and air to filter into the space. “The journey of discovery in the kindergarten is a very liberating one because of the continuous changes, and the endless experiences that are tailored personally to each of the spaces,” the studio concluded. Kientruc O’s previous projects in Ho Chi Minh City include a house and restaurant with a lush garden wrapped in a glazed grid, and a renovated 1940s house with a large lightwell carved into the middle. Photography is by Hiroyuki Oki. 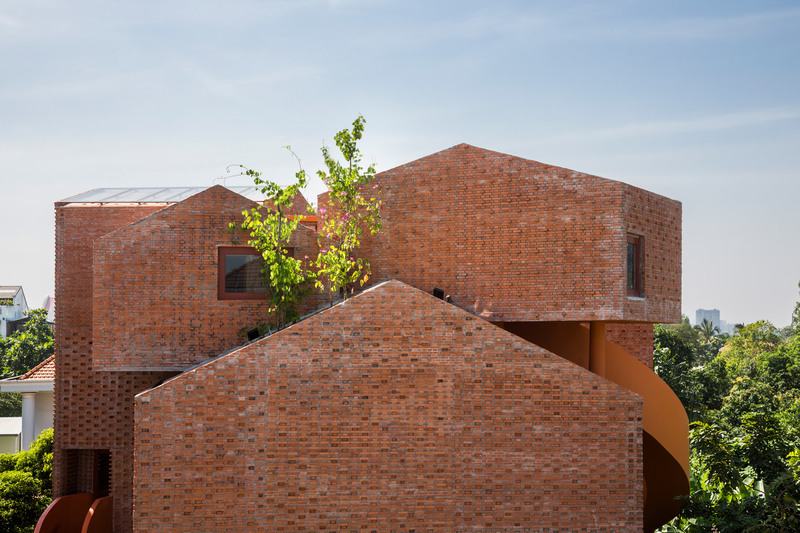 The post Kientruc O completes kindergarten made from a cluster of gabled blocks appeared first on Dezeen.